Greetings from Hong Kong, where I’ll be staying until February! I was hurled right back into a load of schoolwork once I got back from the Philippines, so coverage has been sparse on the blog lately. I’m not off the hook yet, but thankfully some of my biggest tasks have already been completed, so content will start to roll out in a while. Sunday was a busy travel day, consisting of a two-hour bus ride, a two-hour boat ride, another two-hour bus ride and a two-hour plane ride. This was enough time for me to get ready for a few exams that I had on the way back (don’t worry, those are over now). One of the most exciting things for me on the aviation front was the ability to try out Cebu Pacific’s new(ish) A330, which features a 3-3-3 configuration in economy class. This is even narrower than a 3-4-3 configuration on a 777, where each seat is just short of 17 inches wide. While I’ll have a full review on the flight as such, I wanted to share my first impressions of the seats in general. 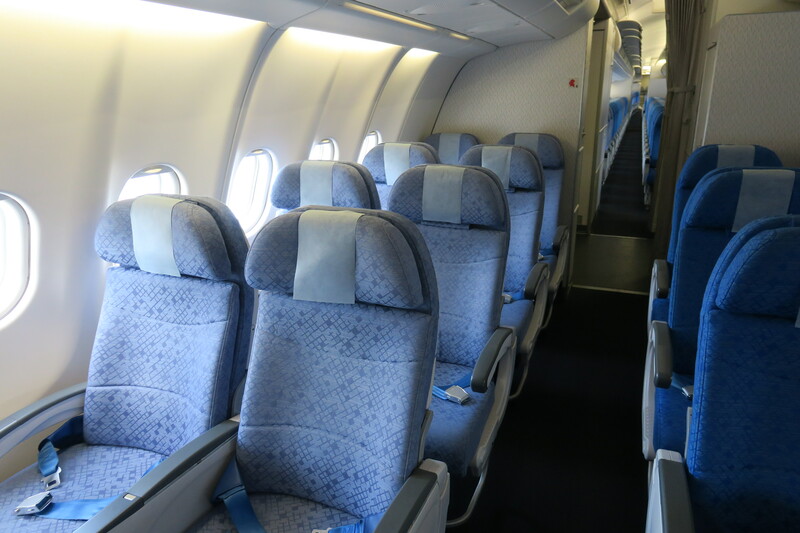 Cebu Pacific’s economy class cabin is simple: it spans the entire plane in a 3-3-3 configuration, for a total of 436 seats. 436 seats is INSANE for an A330. It was a full flight for the most part as well, so it’s not like the extra space is going to waste. I can’t begin to imagine how profitable this plane must be for Cebu Pacific. In comparison, Cathay Pacific’s A330 has 251 seats in total (57% of the seats that Cebu Pacific packs on their flights), 191 of which are economy class seats. And Korean Air’s A380 features 407 seats. That’s right, Cebu Pacific packs more seats into their A330s than Korean Air does into their A380s. I’m not trying to target seat comfort, or anything. Obviously a large number of these 407 seats are premium seats, which Cebu Pacific doesn’t offer on their planes. I’m just trying to put into proportion the sheer number of passengers these A330s take at once. I was assigned window seat 45J, which I sat in for the first few minutes of the boarding process. It was just as tight and cramped as I expected. I wanted to work, socialise and move around during the flight, though, so even though I missed out on some beautiful views, I was much happier with my aisle seat 45G. I had shoulder space to spare from the aisle, and I was also able to angle my feet out when no one was crossing, which I didn’t mind. I had the ideal spot for moving around the aircraft on a 2 hour flight. However, Cebu Pacific operates this A330 all the way from Manila to Riyadh, which is a 10-hour flight. If you do find yourself on a flight of that length, I’d strongly recommend picking an aisle seat, especially if you’re traveling alone. I did feel like the recline was more substantial on the A330 than on the A320, though we boarded last, so I wasn’t able to get a good picture. The legroom was fine, though I probably wouldn’t have enjoyed it as much for a longer flight. I don’t think this is the first sunset I recall seeing from a plane this year, but it has to be one of the best – and I wasn’t even sitting on the same side as the setting sun. Despite not sitting near the window, my friends let me lean over them for pictures – additionally, the doors on the A330 feature windows/viewing hatches in them, and the crew let me point my camera out of them. While our package with Cebu Pacific only provided us with a seat and a bag, one thing that I like about Cebu Pacific is that you can pay for anything with cash (many major airlines only take card payment for purchases). I decided against going for a plushy or a blanket that I probably wouldn’t be using when I got home, but I couldn’t resist trying some of the buy on board menu. It’s worth noting that you can pre-order hot options, but traveling with the school I didn’t have that option. I paid for some cup noodles and a pork floss bun, both of which were pretty good. Meanwhile, my friend’s rainbow bagel was…questionable. It wasn’t bad, but it seemed like more of a novelty item on the menu than anything else (and it ends up being some solid revenue, as almost all my friends on the flight got rainbow bagels for themselves). For those wondering, this flight also featured a trivia session, which was conducted near the end of the flight where a different set of flight attendants scoured every cabin for the one who raised their hand first. The acronyms tested on this flight were “OOTD” (outfit of the day) and “NVM”. Regarding the seat, Cebu Pacific’s A330s are pretty tight – there’s no avoiding the fact that a 3-3-3 economy class cabin on an A330 won’t be the most comfortable. However, on a short flight in an aisle seat, it wasn’t as bad as I’d expected. I love everything else about the airline, though – the trivia session is a nice addition to their branding, the crew were really friendly, and I love that their buy-on-board service accepts cash (which is great for teens traveling together who don’t have credit cards yet, etc.). Their service is so simple, yet perfectly executed towards a specific target audience. Meanwhile Cathay Pacific has some of the world’s best cabin products across all cabins, yet can’t get their sh*t together for life when it comes to their vision and branding.